Hanging out at the Media Indie Exchange rooftop mixer is a great way to check out games while getting facetime with their developers. Of the host of games playing on big screens all vying for my attention, the first one that caught my eye — for good reason, it turned out — was White Rabbit’s Death’s Gambit. 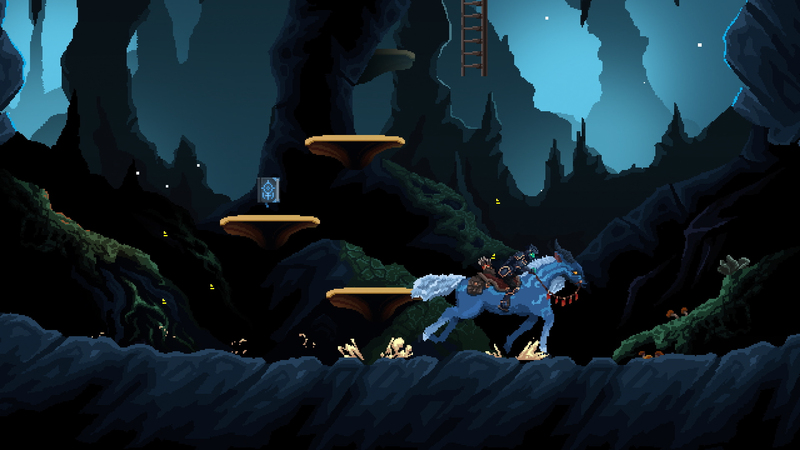 The game tells the story of a mortally-wounded soldier who is spared by Death, only to become his servant. The story wasn’t wasn’t what initially caught my eye. That honor goes to the gorgeous pixel graphics. Games that go down this road usually walk a fine line between being chunky enough to capture pixels’ nostalgic qualities while still showing detail. 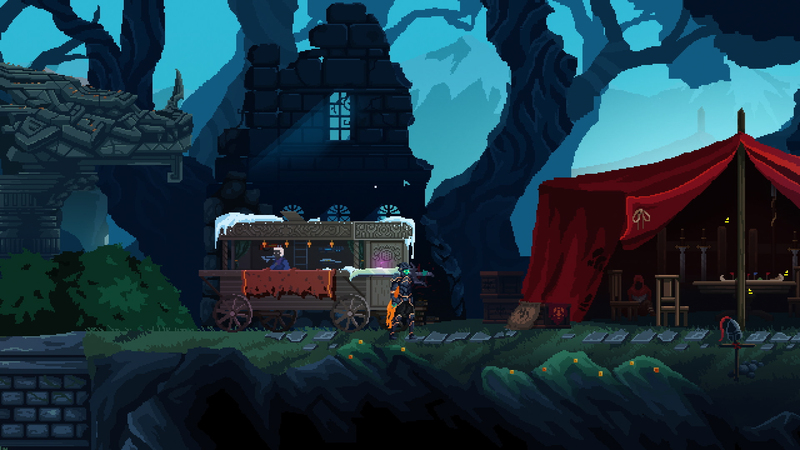 Death’s Gambit does a commendable job balancing the nostalgic chunks with detailed prettiness. As expected from a modern Souls-like, the whole affair is dark, oppressive, and challenging. 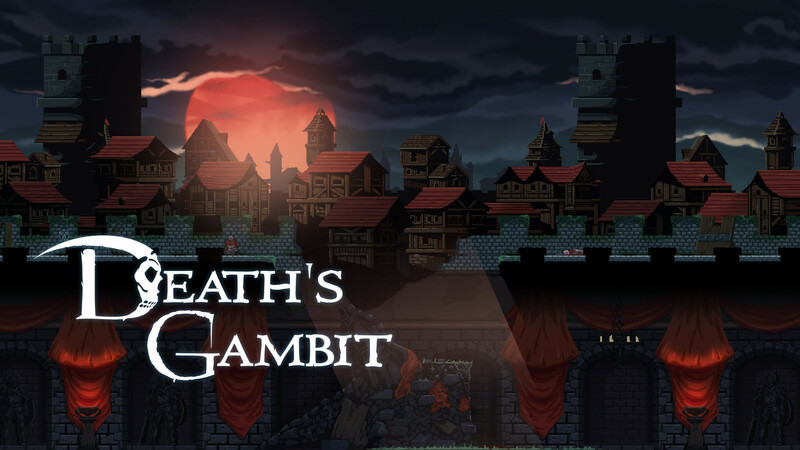 Gameplay-wise, Death’s Gambit is a mix of all the usual suspects — in a good way. While your character can climb and jump his way through the 2D side-scrolling world, combat has a few wrinkles that keep it from being a pure button-mashing affair. During one of my first encounters, I found myself learning how to balance between blocking distant archer fire with my shield while engaging an armored knight in up-close-and-personal combat, trading blows and rolling for safety, and managing my limited stamina that was drained with every blocked strike and action. Just after I had defeated the first knight and moved a few steps further, another knight engaged. No problem, I thought, when suddenly a dragon swooped in from behind, belching a sea of hot death to cover the ground all around me. Luckily, a nearby ruined overhang offered some shelter from the fire, forcing me to a duel to the death with the knight in a limited space, while the dragon continued his bombing runs just outside my safe space. Dispatching the knight, I moved on, up several sets of stairs, approaching the ruins of what was once an important site, and, as is often the case with places like this, probably a worthy protector none-too-pleased about my offensive presence. The next few minutes consisted of, like I thought, a boss fight with an armored opponent several times my size, who leapt about the screen in a frenzy and called forth lightning strikes to fry me in my metal shell. After some traditional pattern-memorization, and a couple of campfire restarts, I was able to dispatch him, only to be told by the developer that he was really more of a mini-boss. Nevertheless, feeling rather pleased with myself, I proceeded further into the ruins, completely bypassing the next save point and, naturally, having depleted my health during the previous battle, falling victim to the very next enemy I encountered. My time with the demo ended at this point, but I had barely scratched the surface. What I saw was already enough to ensure that I will be back once the full game releases on PlayStation 4 and PC this August.